My Patriarch, Gregorious III Laham, Greek Catholic Melkite Patriarch of Antioch (my own diocese) visited London this last weekend. He gave a talk at the Centre for Eastern Christianity at Heythrop College, a Centre with which I am connected as a Fellow and one which is busy trying to help people better know and understand the Churches of the East. But most importantly for the Greek Catholic Melkite Community he served the Divine Liturgy this Sunday with our parish and its two priests and Deacon, Abouna Shafiq, Abouna Robert (myself) and Father Deacon Richard. For once this was very much a Melkite ‘family’ liturgy. Family in the sense that the head of our Church was celebrating the liturgy with the community of one of its newest immigrant parishes. Nobody else was present, other dignitaries, visitors and ecumenical clergy had left us alone to be a Church together. This for me was a very moving moment. You see it is difficult being one of the Oriental Catholic Churches in a Country where not only Catholicism was proscribed for several centuries but where that Catholicism was Latin, Roman. 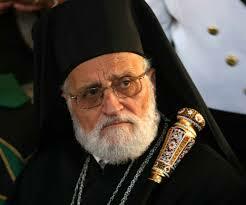 But our Patriarch gave us hope! In his sermon he encouraged the Churches presence in England, a sign as he reminded us, that the Church of Christ has two lungs, East and West and cannot do without either. He also reminded us of Saint John Paul II’s insight that the Holy Land was the spiritual homeland of ‘all’ Christians and asked us by our witness to continually make known the plight and condition of the Christians living there. For those of us who belong to the Church of Antioch this is a poignant reminder of our own family origins long before the Church of Rome, and of what riches the Church of the East can give and share with the Church of the West. As Patriarch Gregorios said, the churches of the Middle East are churches of today’s martyrs, but as we also know from history, martyrdom is the seedbed of the Church. In the midst of horrors of Syria, of the persecution of Christians in Syria and other Middle Eastern Countries, an ecumenism is being forged, one of great hope. He told us that recently all the Catholic and Orthodox Patriarchs of Antioch had met together and would be continuing to meet, a sign of a greater Christen Unity, but he also told us of common efforts with other faiths. Somehow in the midst of all these problems the Holy Spirit is at work. Pray for the Syrian Christians, but above all start to know your Eastern Christian brothers and sisters. Fr Robin Gibbons is an Eastern Rite Chaplain for the Melkite Greek Catholics in Britain.